(L-R): Billy Watson, Chief Executive, SAMH, with Aberdeen City Councillor Sarah Duncan, Vice-Chairwoman of the Integrated Joint Board. A £1.4million mental healthcare project to be introduced to medical practices in Aberdeen has been hailed as the largest of its kind in Scotland. 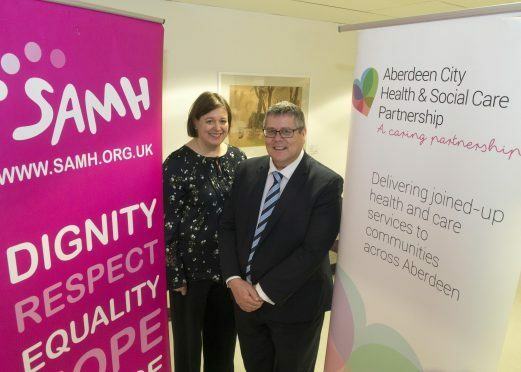 Aberdeen City Health and Social Care Partnership (ACHSCP) has awarded the Scottish Association for Mental Health (SAMH) a contract to employ 20 full-time equivalent “link workers”. Spread across 30 GP surgeries, the staff will ease pressure on mainstream medical services by offering further support than what can typuically be provided by the NHS. They will also spend time engaging with communities about healthcare and show colleagues ways to work more collaboratively. The programme will be rolled out across Aberdeen over the next two years. Billy Watson, SAMH chief executive, said: “This new link worker service is great news for the people of Aberdeen which will see patients who are seeking help and support in their GP surgery gaining quicker access to a wider range of community support and resources, which hopefully will lead to improved outcomes for people. “SAMH is delighted to be working with the ACHSCP in delivering this innovative new programme. Although the link workers will be able to offer support and assistance to anyone in need of health or social care, they will be focused on a number of key types of patients in Aberdeen including those who have endured difficult lives, pensioners who have trouble accessing care services, and more. It is hoped that with early interventions by the link workers, more hospital beds could be made free for those in need. Vice-chairwoman of the Integrated Joint Board, councillor Sarah Duncan, said: “ACHSCP is committed to carefully considering approaches to reduce health and social inequalities. “The link working programme reflects this commitment, and will be an important development to achieve this.